FORT MEADE, Md. 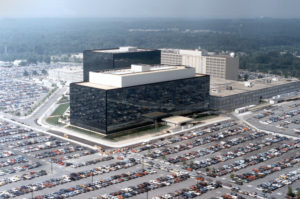 — Several people were hospitalized after a shooting Wednesday morning outside the National Security Agency campus at Fort Meade, but none of the injuries were caused by gunfire, the spy agency said. It began when a vehicle tried to enter the agency’s secure campus without authorization shortly after 7 a.m., the NSA said in a statement. The statement said weapons were fired but “preliminary reports do not presently indicate that there are injuries attributable to gunfire.” The FBI is investigating. The incident did not have any links to terrorism, said a federal official who did not want to be named because they were not authorized to speak publicly. Earlier, Fort Meade garrison spokeswoman Cheryl Phillips had said one person was wounded in the shooting and taken to a hospital. “NSA police and local law enforcement are addressing an incident that took place this morning at one of NSA’s secure vehicle entry gates. The situation is under control and there’s no ongoing security or safety threat,” an earlier NSA statement said. An image taken from a WRC-TV helicopter shows the police and fire department response outside the facility. WRC said bullet holes could be seen in the vehicle’s front window, and air bags were deployed. Blood-stained material could be seen on the ground.